While a cure for hair loss is some years away, a California research team has brought us much closer that such a treatment becoming a reality. Hair loss, a condition that affects 50 million men and 30 million women in the U.S. alone, might fall to stem cell treatments some day. Dr. Alexey Terskikh led the team from the Sanford-Burnham Medical Research Institute in La Jolla, California that showed that stem cells derived from human skin can be used to grow hair in mice. Conventional hair transplantation and other hair restoration treatments that are presently in use must use whatever hair the patient has left. However a stem cell-based procedure could, in theory, grow all kinds of hair on the heads of completely bald men and women. “If this approach is proven to work in humans, it will change existing treatments radically,” Dr. Nicole Rogers, a dermatologist and hair transplant surgeon in New Orleans, told The Huffington Post in an email. Rogers, however, tempered her excitement by advising caution and skepticism, since there have been many “fits and starts” over the years in the hair-restoration field. Rogers added that the Sanford-Burnham group must face many challenges in order to replicate their results in large-scale human trials. The technique exploits the ability of human pluripotent stem cells to differentiate into almost any other adult cell type in the body. Terskikh and his collaborators differentiated induced pluripotent stem cells made from reprogrammed skin cells into the dermal papilla cells that regulate the formation and growth of hair follicles. Furthermore, when they injected these cells into the lower layers of the skin of mice, they grew hair. Human dermal papilla cells are unsuitable for conventional hair transplants because quickly lose their hair-growing potency and cannot be obtained in necessary numbers for clinical purposes. Terskikh wisely did not prognosticate when they would be able to extend their protocol to treat hairless humans. The next step, according to Terskikh is to secure a partner to fund future research into this area. A research team from the University of Iowa has designed a protocol that can create insulin-producing cells that help normalize blood-sugar levels in diabetic mice from skin cells. This discovery represents one of the first steps toward developing patient-specific cell replacement therapy for Type 1 diabetes. This research, which was led by Nicholas Zavazava from the department of internal medicine, was published in the journal PLoS ONE. Zavazava and his coworker used human skin cells taken from punch biopsies and reprogrammed them to into induced pluripotent stem cells. These induced pluripotent stem cells were then differentiated in culture into pancreatic insulin-producing beta cells. In culture, Zavazava’s cell made insulin in response to increased concentrations, but when they were implanted into diabetic mice, these cells responded to glucose, secreted insulin and worked to lower the blood-sugar levels in the mice to normal or near-normal levels. Mind you, these induced pluripotent stem cell-derived beta cells were not as effective as pancreatic cells in controlling blood sugar levels, according to Zavazava in a UI news release. However, Zavazava and his team views the cells’ response in mice as an “encouraging first step” toward the goal of generating effective insulin-producing cells that potentially could be used to not just treat but cure Type 1 diabetes in humans. Zavazava is also a member of UI’s Fraternal Order of Eagles Diabetes Research Center. This center is one of several groups whose aim is to create an alternative source of insulin-producing cells that can replace the pancreatic beta cells that die off in people with Type 1 diabetes. According to the UI news release, this study is the first to use human induced pluripotent stem cells instead of embryonic stem cells to generate insulin-producing pancreatic beta cells. This protocol has the advantage of creating beta cells from a patient’s own cells include. This would eliminate the need to wait for a donor pancreas, since pancreas transplants are an option for treating Type 1 diabetes, but the demand for transplants is much greater than the availability of organs from deceased donors. The use of induced pluripotent stem cells would also eliminate the need for transplant patients to take immunosuppressive drugs. Finally, the use of induced pluripotent stem cells would also avoid the ethical concerns with treatments based on embryonic stem cells. If something lodges in the blood vessels that feed the brain – say a blood clot, piece of bone marrow after a bone has been broken, or tissue debris from damaged tissue – the brain undergoes a loss of blood flow. Since the brain received its oxygen and nutrients from the bloodstream, blockage of the vessels that feed the brain can lead to the death of brain cells. Such a phenomenon is called a stroke or a Trans-Ischemic Attack. However, if the heart stops, blood flow to the brain ceases; not because of blockage of the blood vessels that feed the brain, but because the pump that propels through the bloodstream has stopped and, therefore, blood flow stops. Such a condition is known as global cerebral ischemia or GCI. GCI is one of the most challenging clinical issues encountered during cardiac arrest and, unfortunately, typically indicates a poor prognosis. Severe neurological damage develops in 33%–50% of GCI patients who have survived a cardiac arrest that was documented by a medical professional. In those rare cases of survival after cardiac arrest that was not documented by a medical professional, the percentage of neurological defects is 100%. I hope this convinces you that CGI is a problem. In order to treat GCI, physicians usually induce hypothermia, which lowers and maintains the core body temperature at 32°C–34°C. Presently, this is the only treatment regime that has been demonstrated to improve neurological recovery. Unfortunately, there are many technical difficulties in the application of this therapy. Special equipment is required, and complications such as blood clots and infection are perennial problems. Is there a better way to treat GCI? Sang Won Suh from the Hallym University College of Medicine in South Korea and his colleagues have used fat-based mesenchymal stem cells to treat laboratory animals that have suffered GCI. The results of their study are encouraging. Suh and his coworkers used Sprague-Dawley rats for this study. They anesthetized the rats and then clamped their carotid arteries to reduce blood flow to the brain for seven minutes. This effectively simulates GCI in these laboratory animals. After the clamps were removed, some animals were given one million fat-based mesenchymal stem cells, and others were simply restored by means of unclamping the carotid arteries plus fluid reconstitution. The rats were subjected to behavioral tests three days before the procedure and seven days after it. These tests consisted of placing adhesive tape the forepaws of the animals and then measuring the day it tool for the animals to remove to adhesive tape. After the seventh day post-procedure, the rats were put down and their brains were examined for cell death, structure, blood vessel densities, and degree of inflammation. When the brains of these animals were examined, it was clear that the animals that had received fat-based mesenchymal stem cells suffered much less cell death than the untreated animals. Ischemia-induced degeneration of hippocampal neurons is decreased by MSC treatment. (A): Transient cerebral ischemia caused neuronal death in the hippocampal CA1 region 1 week after insult. Fluorescence images show several FJB+ neurons in the CA1 area after ischemia. Intravenous injection of MSCs after reperfusion provided protective effects on hippocampal neuronal death after ischemia compared with the vehicle-treated group. Scale bar = 100 μm. (B): Box whisker plot shows the quantification of neuronal degeneration in the hippocampus. The number of FJB+ neurons was significantly different among the groups on analysis of variance (p < .001). The post hoc analysis revealed significant differences between the vehicle control and MSC-treated groups (p < .001) and the vehicle control and sham operation groups (p < .001) in the hippocampus. ∗, statistically significant result from post hoc analysis; ○, outlier case. Abbreviations: FJB, Fluoro-Jade B; GI-MSC, human MSC-treated group after ischemia; GI-PC, vehicle control group after ischemia; MSC, mesenchymal stem cell; SH-PC, sham operation group with vehicle control. In the figure above you can see a Fluoro-Jade B staining of these brains. FJB stains detect dying cells. As you can see, the brain from the rats that experienced GCI without any stem cell treatments had lots of dying cells in their brains. The “sham” operated rats – rats that were operated, but their carotid arteries were not clamped – had no cell death in their brains. The animals that had their carotid arteries clamped, but were given fat-based mesenchymal stem cells had a little cell death. The graph above shows the vast differences between the stem cell-treated and the non-stem cell-treated groups. Truly these are significant results. Other experiments that detected Now this is no a surprise, since Ohtaki and others showed a very similar result in 2008 (Ohtaki H, et al. Proc Natl Acad Sci USA 105:14638–14643 ). Suh, and his group, however, took these experiments further to determine why these cells prevented cell death in the brain after GCI. When Suh and his team examined the leakage of large proteins into the brain, they saw something quite remarkable; the mesenchymal stem cell-treated rats only leaked a little protein into their brains compared to the non-stem cell-treated rats. Ischemia-induced blood-brain barrier (BBB) damage was reduced by MSC treatment. BBB damage in the hippocampus after ischemia shown. (A): Low-magnification photomicrographs showing IgG-stained coronal hippocampal sections. Sham-operated rats showed sparse IgG staining in the hippocampus. At 1 week after ischemia, the entire hippocampus was intensely stained with IgG immunoreactivity, indicating that substantial BBB damage had occurred in the vehicle-treated rats. 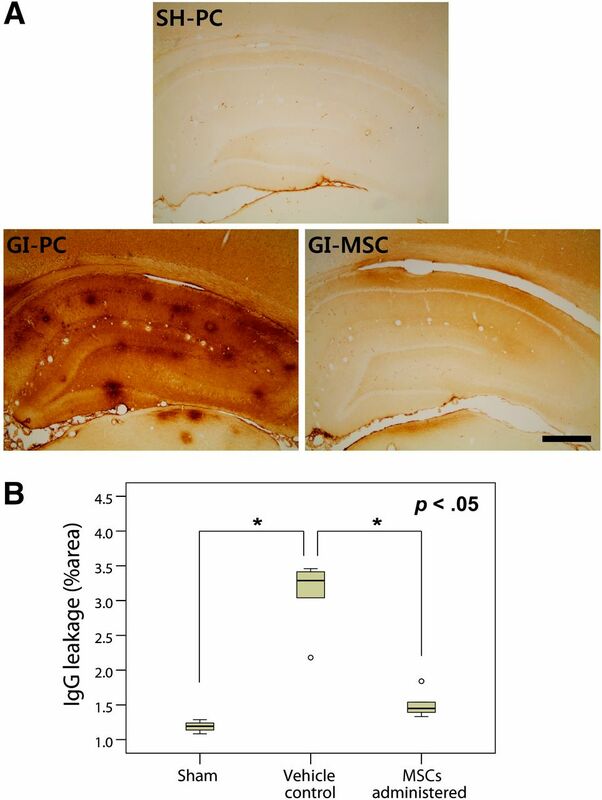 Injection of MSCs after ischemia reduced the intensity of IgG staining in the hippocampus compared with that in the vehicle-treated group. Scale bar = 500 μm. (B): Box whisker plot shows the quantification of IgG intensity in the hippocampus. The intensity was significantly different among the groups on analysis of variance (p < .001), and post hoc analysis revealed significant differences between the vehicle control and MSC-treated groups (p < .001) and vehicle control and sham operation groups (p < .001) in the hippocampus. ∗, statistically significant result from post hoc analysis; ○, outlier case. Abbreviations: GI-MSC, human MSC-treated group after ischemia; GI-PC, vehicle control group after ischemia; MSC, mesenchymal stem cell; SH-PC, sham operation group with vehicle control. The presence of the brown color indicated the presence of a protein in the brain that normally does not find its way to the brain unless the integrity of the blood-brain barrier is compromised. As you can see, the non-treated animals have a truckload of this protein in their brains, which indicates that their blood-brain barriers are very leaky. On the contrary, the stem cell-treated brains are not nearly as leaky and the sham operated brains are not leaky at all. These results suggest that the stem cells help maintain the structural integrity of the blood-brain barrier in GCI patients and this prevents nasty things from the bloodstream, such as immune cells and so on from accessing the brain and ravaging it. To test this hypothesis, Suh and others examined the brains for the presence of neutrophils, which are white blood cells that show up when inflammation occurs. These cells are not found in the brain unless the blood-brain barrier is damaged. Sure enough, brains from the sham-operated rats showed no signs of neutrophils, brains from the non-stem cell-treated rats were chock full of neutrophils, and the brains from the stem cell-treated rats only had a few neutrophils. Clearly this merits more work. Larger animal models will need to be examined, and also it would be nice to know if administration of exosomes from mesenchymal stem cells can elicit a similar biological response. However his is a very hopeful beginning to what might become a fruitful bit of clinical research. Muhammad Ashraf is a professor of Pharmacology at the University of Illinois in Chicago. Dr. Ashraf and his colleagues have published some very fine papers that have examined the ability of stem cells to heal the heart after a heart attack. Recently, Ashraf’s team examined the ability of a particular population of bone marrow cells, characterized by the presence of the Sca-1 protein on their cell surfaces, to heal the heart after a heart attack. In particular, Ashraf’s group genetically engineered Sca-1-positive cells to secrete a cocktail of growth factors, and then they tested the ability of such cells to heal a damaged heart. Sca-1 is a protein that is found on the surfaces of hematopoietic stem cells and other cell types as well. Therefore, selecting Sca-1 cells will not necessarily give you a pure cell population. However, such cells can be readily isolated and genetically engineered to make these growth factors. Ashraf and his coworkers isolated Sca-1 cells from the bone marrow of mice that expressed a glowing green protein. These cells were then genetically engineered with plasmids (small circles of DNA) to express the growth factors Insulin-like growth factor-1, vascular endothelial growth factor, hepatocyte growth factor, and stromal cell-derived factor-1alpha. All four of these growth factors have been shown to play supportive roles in the healing of the heart after a heart attack. When these genetically engineered Sca-1-positive cells were co-cultured with other cells and then grown in low oxygen conditions, the genetically engineered cells prevented the other cells from dying. The genetically engineered cells are grew faster in culture than their non-genetically engineered counterparts. When the culture medium in which these genetically engineered cells were grown was used to grow umbilical vein endothelial cells (UVECs), those UVECs showed increased rates of growth. This suggests that the genetically-engineered Sca-1 cells secreted growth factors into their culture medium and these growth factors are the reason these cell grow faster than non-genetically engineered Sca-1 cells. When these same cells were injected into the heart tissue of mice that had suffered from heart attacks, they were able to survival over twice as well as non-genetically engineered Sca-1 cells. When the laboratory animals that received the injections of genetically engineered Sca-1 cells were put down 4 weeks after their stem cell treatments, their hearts were removed, sectioned and examined in detail. These examinations clearly showed that hearts from those mice that had received injections of genetically-engineered Sca-1 cells had increased blood vessel densities. There was an additional surprise, since the injected Sca-1 cells were taken from green-glowing mice, they also glowed green. Green-glowing cells were shown to express Cx43 (the protein that links heart muscle cells together and lets them beat in harmony) and be connected to host heart muscle cells. This suggests that a bone marrow cell population can actually electrically connect with a heart muscle cell, which is something bone marrow cells are not supposed to be able to do. Mind you, the number of connected cells was small, and they could be doing this simply as a result of cell fusion. Additionally, injection of genetically-engineered Sca-1 cells also decreased the infarct size in the hearts of these mice. The size of the infarct in the treated mice was less than half that of the untreated mice. This shows that Sca-1 cells from bone marrow have the capacity to augment recovery of the heart after a heart attack, and that this ability is further increased through the co-administration of growth factors. Using such a system in human patients will require the determination of the precise dosage of these growth factors, since using genetically engineered cells in human patients will probably not be approved in the near future. In 2007, Eduardo Marbán and his colleagues have discovered a stem cell population from the hearts of mice and humans that grow as small balls of cells in culture (see RR Smith, et al., Circulation. 2007 Feb 20;115(7):896-908). He called these cells “cardiospheres” and in a follow-up study showed that these cells have the ability to differentiate into heart muscle cells, blood vessel cells, or other types of heart-specific cells (PV Johnson, et al., Circulation. 2009 Sep 22;120(12):1075-83). Other animal experiments by Marban’s group showed that not only were cardiospheres easily obtained by means of heart biopsies, but injection of these cells directly into the heart after a heart attack augmented healing of the heart and accelerated the recovery of heart function and while preserving heart structure (ST Lee, et al., J Am Coll Cardiol. 2011 Jan 25;57(4):455-65; CA Carr, et al., PLoS One. 2011;6(10):e25669; Shen D, Cheng K, Marbán E. J Cell Mol Med. 2012 Sep;16(9):2112-6). All of these very hopeful results in culture and in animal studies eventually gave way to a small human clinical trial in which a heart patient’s own cardiospheres were transplanted into their own hearts. This clinical trial, the CADUCEUS trial (which stands for cardiosphere-derived autologous stem cells to reverse ventricular dysfunction), prevent patient’s hearts from worsening, but more remarkably, the heart scars of these patients were partially erased 6 months after treatment. A one-year follow-up showed that patients had improved global heart function that directly correlated to the shrinkage of their heart scars. These results are very encouraging and Marbán made it clear that he wants to conduct larger clinical trials. However, he still had a gaggle of unanswered questions about his cardiospheres. Do these cells affect blood vessel formation? Can they prevent the enlargement of the heart that occurs after a heart attack (known as cardiac remodeling)? Can the benefits of these cells be solely linked to their effects on the heart scar? Do cardiospheres prevent the formation of the heart scar? Do they only help heal the area of the heart where they are administered or do they also help more far-flung regions of the heart? These are all good questions, and answers to them are necessary if Marbán and his group is to conduct larger and more intense clinical trials with human heart patients. Therefore, he turned to an animal model system to address these questions in detail. In particular, he chose Wistar Kyoto rats. Readers of this blog will recognize the experimental strategy; break the rats into three groups, induce experimental heart attacks in two groups, give one group cultured cardiospheres and leave the other one alone. Thus you have a sham group that underwent surgery but was not given a heart attack, a heart attack group that did not receive cardiospheres, and a heart attack group into which 2 million rat cardiospheres were injected at four different sites near the site of the infarct. This experiment, did far more than simply monitor the heart function of the animals for several weeks. Instead, some of these animals were sacrificed and their hearts were subjected to extensive biochemical and molecular biological tests. The goal of these experiments was to determine not just if the cardiospheres helped heal the heart. Marbán and his group already knew that they do. They wanted to know how they heal the heart. The cardiosphere-treated animals showed substantial improvements in their heart function as opposed to their non-treated counterparts. The treated animals had heart that did not undergo remodeling and also pumped better. Hearts from the cardiosphere-treated animals had less dead heart tissue and more live tissue. They had smaller heart scars, and better preservation of cellular structure in the heart. When biochemical markers of proliferating cells were measured in these hearts, the cardiosphere-treated hearts showed robust increases in cell proliferation far above those hearts that were not treated with cardiospheres. Thus cardiospheres seem to induce resident heart cells to divide and replace dead and dying heart cells. A common response to a heart attack is that the surviving heart cells enlarge (hypertrophy). The cardiosphere-treated hearts showed no such response. Also, when the blood vessel density of the heart tissue was determined, the cardiosphere-treated hearts had close the twice the vessel density of the non-treated hearts. This was the case near the site of cardiosphere injection, but it also held, albeit not as robustly, in areas far from the site of cardiosphere injection. This suggests that blood vessel formation is due to secreted molecules. To test this possibility, Marbán and his crew rigged a culture assay in which rings of tissue from the aorta (the largest blood vessel in the body), were embedded in collagen and treated with culture media from cardiospheres, standard culture cell culture media, or cell culture medium from endothelial cells. The cardiosphere culture medium, which contains a cocktail of molecules secreted by growing cardiospheres as they have grown in culture, induced far more blood vessels in this system than the other two. This confirms the notion that cardiospheres secrete blood vessels-inducing molecules that this increases the vascularization of the heart muscle, this aiding its survival. Marbán and his team also examined the molecule that forms the heart scar; collagen and how cardiospheres affect the synthesis and deposition of collagen. They discovered that cardiospheres actually degrade the collagen at the heart scar. They showed that cardiosphere secrete enzymes that have been documented to degrade collagen (Matrix Metalloproteases 2 and 13 for those who are interested). Marbán and others also discovered that cardiospheres put the kibosh on collagen synthesis. When they measured biochemical markers of collagen synthesis (hydroxyproline), they were present at rather low levels. Thus cardiospheres prevent the deposition of the heart scar and also actively degrade it. Thus, Marbán and his colleagues showed that cardiospheres: 1) prevent the tissue-level changes associated with cardiac remodeling; 2) preserve heart function locally and globally; 3) increase the proliferation of heart muscle cells at the site of the infarct, and to a lesser effect, throughout the heart; 4) induce the formation of new blood vessels at the site of injection, and, to a lesser extend, further from the site of cardiosphere injection; and 5) actively prevent the formation of the heart scar by inhibiting its formation and degrading whatever collagen has been deposited. Thus cardiospheres decrease the formation of collagen and therefore, decrease the stiffness of the wall of the heart. They also product new blood vessels and provide a supportive environment for the formation of new heart muscle cells. This paper was published in PLoS One (2014) 9(2):e88590. May Marbán’s clinical trials increase!! Diabetes researchers at Saint Louis University have discovered a way to prevent the onset of Type I diabetes mellitus in diabetic mice. This strategy involves inhibiting the autoimmune processes that result in the destruction of the insulin-secreting pancreatic beta cells. Type I diabetes is a life-long disease that results from insufficient production of the vital anabolic hormone insulin. In most cases of Type I diabetes mellitus, the body’s immune system destroys insulin-producing beta cells, and this insulin deficiency causes high blood sugar levels, also known as hyperglycemia. Treatments for the disease require daily injections of insulin. A group of immune cells known as lymphocytes come in two main forms: B lymphocytes, which secrete the antibodies that bind to foreign cells and neutralize them, and T cells, which recognize foreign substances and regulate the immune response. There are several different types of T lymphocytes, but for the purposes of this discussion, two specific subtypes of T lymphocytes seem to be responsible for the onset of Type I diabetes. T “helper cells” that have the CD4 protein on their surfaces, and T “cytotoxic “ cells have the CD8 protein on their cell surfaces seem to play a role in the onset of Type I diabetes, but a third subtype of T lymphocyte has remained a bit of an enigma for some time. This subtype of T lymphocytes is a subcategory of CD4 T cells and secretes a protein called “interleukin 17,” and is, therefore, known as TH17. Dr. Burris and his collaborators from the Department of Molecular Therapeutics at the Scripps Research Institute have been examining TH17 cells for some time and they came upon a pair of nuclear receptors that play a crucial role in the development of TH17 cells. Could hamstringing the maturation of TH17 cells delay the onset of Type 1 diabetes mellitus? Burris and others targeted these receptors by using drugs that bound to them and prevented them from working. This prevented the maturation of the TH17 T lymphocytes. When two nuclear receptors, Retinoid-related orphan receptors alpha (ROR-alpha) and Gamma-t (ROR-gamma-t) were inhibited, they prevented the autoimmune response that destroyed the beta cells. To block these ROR alpha and gamma t receptors, Burris and others used a selective ROR alpha inhibitor and a gamma t inverse agonist called SR1001 that was developed by Dr. Burris. These drugs significantly reduced diabetes in the mice that were treated with it. These findings show that TH17 cells play a significant role in the onset of Type I diabetes, and suggest that the use of drugs like these that target this cell type may offer a new treatment for the illness. According to the American Diabetes Association, only 5% of people with diabetes have the Type I form of the disease, which was previously known as juvenile diabetes because it is usually diagnosed in children and young adults. The organization said that over one-third of all research they conduct is dedicated to projects relevant to type 1 diabetes. Patients who survive an acute lung injury are able to recover their lung function, which suggests that adult lungs regenerate to a certain extent. Depending on the cause and severity of the injury, multiple progenitor cells, including alveolar type II cells and distal airway stem cells, have been shown to drive lung tissue regeneration in mice. Now, Andrew Vaughan and others have described another cell type in the lungs involved in the repair process in mice when mouse lungs are damaged from influenza virus infection or inhalation of the anticancer drug bleomycin. This cell type is called the rare lineage-negative epithelial progenitor (LNEP). LNEP cells are quiescently present within normal distal mouse lung and do not express mature lineage markers (for example, a protein called club cell 10 or CC10 or surfactant protein C, otherwise known as SPC). However, Vaughan and others demonstrate that LNEPs are activated to proliferate and migrate to damaged sites and mediate lung remodeling following major injury. Vaughan and others used lineage tracing approaches and cell transplantation strategies and showed that LNEP cells, but not mature epithelial lineage cells, are multipotent in their ability to give rise to both club cells and alveolar cells. Interestingly, activation of the Notch signaling pathway in LNEP cells initially activated them, but persistent Notch activation inhibited subsequent alveolar differentiation, resulting in failed tissue regeneration (characterized by the formation of abnormal honeycomb cysts in the mouse lung). Thus Notch signaling is only required at the beginning of their activation, and then must be down-regulated if the LNEP cells are to reconstruct normal lung tissue. Interestingly, scarred over or fibrotic lungs from patients with idiopathic pulmonary fibrosis or a disease called scleroderma show evidence of hyperactive Notch signaling and their lungs also contain very similar-looking honeycomb cysts. This strongly suggests that dynamic Notch signaling also regulates the function and differentiation of LNEP-analogous human lung progenitor cells. Thus designing treatments that properly regulate Notch signaling and, consequently, LNEP activity may potentially halt the development of lung fibrosis in humans.